On Monday, a small band of Nebraskans, angered by Sen. Ben Nelson’s healthcare vote, began organizing a ballot initiative to add recall elections to the state’s constitution. If they can collect 113,000 signatures by July 2, the question will reach voters in November and Nebraska might become the 20th state to permit the recall of elected officials by petition. Still, the proposed recall rule in Nebraska is notable because the signature requirement would make for one of the laxer recall laws in America. 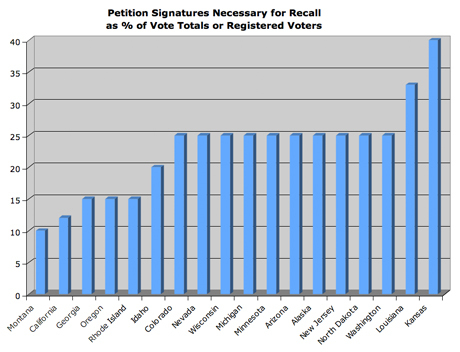 Compare this with the signature standard in most recall states: 25 percent of all votes cast in the last election. Or consider the case of New Jersey, where a tea party group trying to recall Sen. Robert Menendez is scrambling to collect 25 percent of the total number of registered voters -- about 1.3 million certified signatures. The lowest standard for any state arguably belongs to Montana, which requires just 10 percent of the total registered voters at the time of the last election. Kansas’ signature qualification is the steepest: 40 percent of the entire vote cast in the last election for that office. There are other restrictions that make recall elections difficult: the amount of time that needs to lapse between the inauguration and the start of the recall drive, for instance, or the number of days that petitioners are given to collect the needed signatures. Some states even require the listing of legitimate grievances. So as Republicans look for ways to rage against the new healthcare law, get ready to see more attempts at recalls -- though "attempt" ought to remain the operative word there. John R. Bohrer is writing a book, "The Revolution of Robert Kennedy: The Senator, His Aides and The Sixties Breaking Open."